The document is (facsimile) signed by Generalfeldmarschall 'Erich von Manstein'. Nice original award in very good condition! Krim shield available in INSIGNIA section. 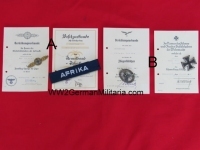 IRON CROSS 2ND CLASS, 1939 AWARD DOCUMENT. Nice original award in good condition! Cross available in DECORATIONS section. RUSSIAN FRONT MEDAL 1941/42 AWARD DOCUMENT. Medal available in DECORATIONS section. Nice original award in average condition! Cross and badges available separately in DECORATIONS section. Booklet for the "Deutschen Reichsbundes für Leibesübungen" sports award. White cover with "DRL" badge. The first page is blank. The second page with picture of Unteroffizier Ludwig Berger. Following pages lists the required qualifications for the award, as well as handwritten details. Last pager show he get awarded 26 June 1939. DRL badge available in INSIGNIA section.